McDRIFT is a McKenzie-type drift boat popularized in the Pacific Northwest and Canada. The welded aluminum hulls, available in 14' or 16' lengths, are of monocoque construction where the outer covering skin carries a major part of the stresses, eliminating most internal framework. This simplifies the construction and makes for a lighter hull. To make the construction easier, Full Dimensional layouts are provided for the side and bottom sheeting. No need to cut and fit the aluminum covering. The computer developed panels provide accurate contours that are quickly and easily reproduced directly to the aluminum. 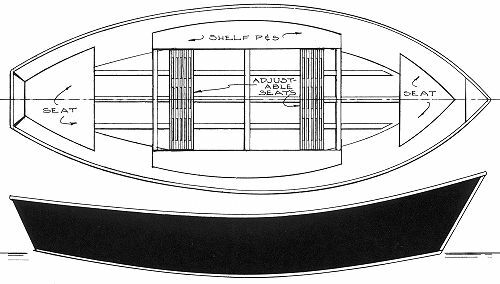 Plus, the layouts simplify the construction, eliminating numerous temporary forms that shape the hull to further make building quicker and easier. The detailed plans for McDRIFT are available for building in a 14' or 16' length. Standard aluminum extrusions used in the construction, flat bars, angles, or channel sections in the noted alloys are readily available and eliminate the need for custom bending or forming. All seams are joined by welding to make the stress skin hull extremely rugged to take it in most any condition of use. Build your own drift boat, have fun and enjoy the resultant project with the pride of accomplishment that follows building your own boat.